World of Tanks Gets Its Own Comic! Wargaming and Dark Horse Comics are joining forces to bring World of Tanks to new territories! As a result, the anticipated first issue of the World of Tanks: Roll Out comic series will be available in comic book stores and via digital distribution on 31 August. The first ever comic book inspired by Wargaming’s massively multiplayer online game—World of Tanks—brings all the thrills, tension and armoured conflict World of Tanks players demand. This hard-hitting story, written by Garth Ennis (Preacher, War Stories, The Punisher), is a historically-based war tale, skilfully illustrated by the renowned Carlos Ezquerra (Judge Dredd, Strontium Dog, War Stories Vol. 2). Each issue is wrapped in the epic cover art of Isaac Hannaford (Halo: Reach, The Punisher) and is bursting to the seams with explosive action. 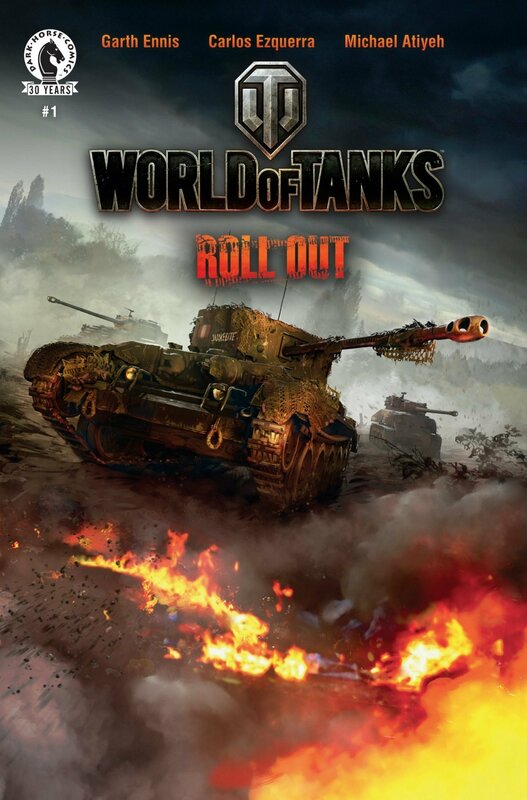 Set during the epic tank battles of 1944, which proved to be pivotal to the outcome of the war, World of Tanks: Roll Out follows a crew of young British tankers as they push deeper into post-D-Day Normandy, toward a battalion of seasoned German armoured units. Flanked and tracked by Axis forces at almost every turn, the inexperienced British tankers traverse a battle-scarred France, while the danger around them escalates and the outcome of the war hangs in the balance. For 30 years, Dark Horse Comics has proven to be a stellar example of how integrity and innovation can help broaden a unique storytelling medium and establish a small, homegrown company as an industry giant. Founded in 1986 by Mike Richardson, the company is known for the progressive and creator-friendly atmosphere it provides for writers and artists. In addition to publishing comics from top talent, such as Eric Powell, Mike Mignola, Geof Darrow, Brian Wood, Gail Simone, Stan Sakai, and Guillermo del Toro, as well as comic legends such as Will Eisner, Milo Manara, Kazuo Koike, Neil Gaiman and Frank Miller, Dark Horse has developed its own successful properties, such as The Mask, Ghost, X and Barb Wire. Its successful line of comics, manga and products based on popular properties includes: Dragon Age, Buffy the Vampire Slayer, Aliens, Conan, Tomb Raider, Halo, The Witcher, Serenity, Game of Thrones, and Avatar: The Last Airbender. Today Dark Horse Comics is the largest independent comic book publisher in the US and is recognized as one of the world’s leading entertainment publishers.